Mr. Brown prefers to be alone, at least that’s what he says. Then one day, a woodpecker takes up residence in his hat – and then another and another. 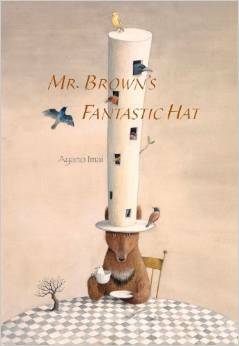 Soon, Mr. Brown’s hat is full of birds. When they all fly away for the winter, Mr. Brown says he doesn’t care, but even he doesn’t believe that. Will the birds return when Mr. Brown wakes from his own hibernation? What other surprises are in store? Mr. Brown’s Fantastic Hat is a gorgeous book with a solid message about the power of community and connectedness. The author and illustrator, Ayanao Imai, joins a gentle narrative style with highly engaging yet equally gentle illustrations. The result is a book that children will want to return to again and again. Imai’s illustrations are spare with subtle variations in color that provide an overall sense of harmony. Her use of light is strong, but never overpowering. So many picture books today rush toward the reader with jarring color and over-the-top perspective. Sometimes that works, but what a delight to encounter Imai’s visual invitation to the reader. Her work is lively but spare and makes room for a child to enter the picture, and thus the story as a whole. What will delight young readers most is the placement of small, surprising objects in each scene. The laundry hanging up to dry includes socks, dish towels and two mushrooms. A tree branch grows out of the wall. The objects are so skillfully drawn and carefully composed that it isn’t until after some observation that the objects appear. The story speaks to loneliness, community, and the power of connection. Those themes will speak to both children and adults and they underscore exactly why we gather in religious community. The story could certainly be adapted for telling, yet the artwork is so perfect it seems a shame not to share it as a book. The details are fine and colors subtle, so you will want the children close to see it.